Abu Dhabi - Lewis Hamilton and Sebastian Vettel agreed on Thursday that next season's Formula One halo-carrying racing cars will be uglier, but safer - and joked about their on-track clashes during this year's world title tussle. The two four-time champions spoke at a news conference ahead of this weekend's season-ending Abu Dhabi Grand Prix where the 32-year-old Briton is hoping to claim his 10th win of the season for Mercedes. Vettel, who won the Brazilian Grand Prix two weekends ago, aims to beat him and secure runners-up spot in his Ferrari. Both were in a light-hearted mood with Hamilton suggesting he is aiming for a fifth title next year when, according to a grinning Vettel, he and Ferrari will enjoy a "walk in the park" if they can match or improve on their progress in 2017. But they were serious about the future looks and safety of the cars they will race. "It's the last time where the cars will look good," said Hamilton, looking ahead to this weekend's race. "I think, from next year, it's all downhill in terms of how it looks, but safety will go up at least." "It's no doubt the cars look better the way they are now, but I'm sure that we'll get used to it. We'll work on the aesthetics so that it will look fine. In the end it's probably less of a big deal." 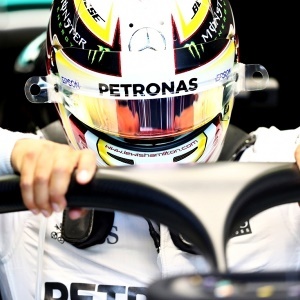 F1 is introducing the 'halo', a cockpit protection device, to prevent flying debris hitting the drivers. The two rivals also reflected on the season past. Asked to choose their highlights, Vettel smiled and suggested they "start with Baku - break the ice?" Hamilton responded with an audible "Hmmmm... Baku is a good one." It was in Baku that a volatile Vettel drove his Ferrari into Hamilton's Mercedes while they were under Safety Car conditions. Hamilton added: "We need more races like Barcelona, wheel to wheel..."
Earlier this week, Hamilton had told motorsport.tv that he warned Vettel about the future following their Baku clash. "When I spoke to him later, I was like 'that's a sign of disrespect so don't ever disrespect me like that again otherwise then we will have problems'," said Hamilton. "I've never done that to someone. I don't even know what he was thinking to have done...I've never been in a position like that. I guess people react differently under certain pressures." On Thursday, he added: "It was great to have those close battles this year with Sebastian, a four-time world champion you respect." Asked about next year, he said: "I feel very honoured to be close to a great sporting icon in Juan Manuel Fangio. He's kind of the godfather of the sport." Looking back, Vettel said: "It has been close for most of the year, but not close enough when it mattered. From that, we have made our conclusions, learned our lessons, so that will help us next year. "We are completely fired up. It has been bitter, but I think it has been positive that we have had a couple of races (since Mexico) to approach and look forward to next season." Hamilton did not talk about his contract with Mercedes following overnight reports claiming that he is poised to finalise a new three-year deal valued at £120 million.